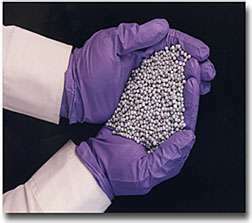 Scientist holding sorbents (pellets) in gloved hands. When coal is used to generate electricity in power plants, carbon from the coal bonds with oxygen from air to make carbon dioxide (CO2). Due to concerns about how CO2 impacts global climate, scientists at DOE's National Energy Technology Laboratory are developing materials and processes to separate and capture it from power plants for permanent disposal. Ideally, the capture process will not create new waste materials, is quick and efficient, and the CO2 ends up as a high-pressure gas that can be transported in a pipeline to be injected into an oil field or a deep geologic formation. Researchers at NETL are developing chemicals called sorbents that absorb carbon dioxide after it is created in power plants. Some sorbents react with the CO2 to create solid materials; these solids can be easily separated from gases in the power plant. Once separated, the solid is chemically broken down into CO2 gas and the original sorbent chemical is recovered, and thus re-used to capture more CO2. Good sorbents have a high CO2 capture capacity and react relatively rapidly with CO2 at temperatures close to those in the power plant. Reversing the reaction to regenerate the sorbent and release the CO2 must also be efficient and the conditions cannot be too extreme. Fortunately, there are literally millions of possible solid materials that could be used as sorbents, but identifying good ones is a bit like finding needles in a haystack, so NETL researchers use a combination of computer modeling and experiments to identify and test sorbents that will work in a power plant environment. Computer programs can sort through mountains of thermodynamic data on materials reacting with carbon dioxide, and other programs can calculate those properties when they aren't available. Using these programs together, many new materials can be evaluated rapidly to narrow down the field to the most promising few. Using this methodology, researchers investigated a series of lithium silicates with different Li2O/SiO2 ratios and explored their CO2 capture properties. They found that adding SiO2 to decrease this ratio made CO2 capture more favorable at power plant operating temperatures. This work was described recently in Physical Chemistry Chemical Physics. A magnesium hydroxide sorbent has recently been developed that can be used for carbon dioxide capture from coal gasification plant gas streams. These gas streams are at high pressures and relatively warm temperatures, and contain hydrogen and steam in addition to CO2. In the process, CO2 and Mg(OH)2 react to form magnesium carbonate at 150-250 °C and 380 psi, followed by breakdown of the magnesium carbonate above 350 °C and regeneration of Mg(OH)2. Because the process can work at higher pressure, it takes significantly less energy to compress the CO2 to make it ready for pipeline transport. An analysis compared a theoretical integrated gasification combined cycle (IGCC) plant using the Selexol process, a competing CO2 capture method, with one using the proposed Mg(OH)2 process. Using the magnesium hydroxide sorbent, the plant required 62% less energy to compress the CO2, and the overall efficiency of the plant increased by 1%. U.S. Patent 8,470,276 has been issued on the new process. I agree with Teech2. Carbon BAADDD!!! Carbon producing plants should be taxed heavily per ton of Carbon. I'd like to add the CO2 should not be sent underground. Compressed CO2 canisters could be used in greenhouses or newer nano particle filters can separate the CO2 much like an artificial leaf catalyst. I think attitudes toward Solar, Hydrogen, and fuel cells are turning seeing the efficiency of newer advances will make coal and oil obsolete. Burning fossil fuels releases CO2 that has not existed on the Earth for millions of years. Even it they converted it to fertilizer or some other nicity, it wouldn't help long. It does not focus on the root cause. Why is CO2 increasing? And a better question, how can you trust "inceasing" CO2 info., from the top of an increasingly active volcano? Or word weather dumping-grounds? Wouldn't it be better to get it from non-isolated, non-biased spot? Like central Pennsylvania, Kings's Ranch, and aggregate? The oceans were formerly able to 'sink' all the CO2 man could produce. What happened? Wiki has a nice article on "Dead Zones." Just plant land plant and seagrass etc. No sense wasting energy on co2 capture. Capturing CO₂ as CO₂ is expensive rather than value added like indeed using traditional and innovative atomic energy to water deserts and produce vast quantities of genetically modified crops that create ten billion people worth of permanently sequestered carbon in future aerlooms via advanced bio-composite materials and basic good design. A wooden table from the time of Michelangelo is worth a million dollars now, as are very old violins. But now that climate models are fully falsified and Climatology shown to be junk science (Marcott's 2013 hockey stick in Science that was celebrated by Mike "Climate Wars" Mann has not been retracted despite the blade being based on rogue data tampering after the fact of the author's Ph.D. theses containing the same data which shows no sudden upswing), each billion spent on immature applied technology instead of basic hard science is a massive (billions, not millions!) opportunity cost that impoverishes the future, rendering mankind desperate. Real user Neinsense99 and three sockpuppet accounts that have never posted a single comment are downrating all sincerely skeptical comments, downrating the very essence of science, the central organizing principle that distinguishes it from the mere liberal arts and politics. This article reads like a promo from the coal industry. Left unsaid is whether there is *any* chance that *any* CO2 absorbent method could possibly scale in a way to make coal economical to burn as compared to other energy sources. The answer to that question is an unqualified 'no.' Shoveling absorbents into and out of power plant stacks, energy expended to separate CO2 from the absorbent, and disposal of CO2 all will generate costs that will overwhelm the economic benefit of burning coal. The only reason this research continues is Congressional pork. Nice! Just a little point: IN which way would crops _permanently_ sequester_ anything? Ah, OK, I got it It's the GMO effect and the added radiation from the Atomic Plants that give the crops superpowers to fight against the Evil Climate with his Hockey stick of Doom!!! Will Stan lee be in charge of the Movie version? I'm already looking forward to it!!! I agree with Teech2. Carbon BAADDD!!! Carbon producing plants should be taxed heavily per ton of Carbon. Are you listening to CNN's ignorant reporters or something? How many bowls of DMT have you smoked? I think you are seriously misled. Taxes are not meant to be punishment, they are meant for support of systems for the good of the people. When you think of a tax as a penalty, feces hits the fan, and you get corrupt officials everywhere.. Everything is taxed enough already. Carbon is also not bad in and of itself, but only in great concentrations and only when combined with other elements.